This is a new 12-inch figure in the Marvel Legends collection from Hasbro. Rather than the film versions with which so many people are familiar, it’s nice to see a return to the comic book interpretations. 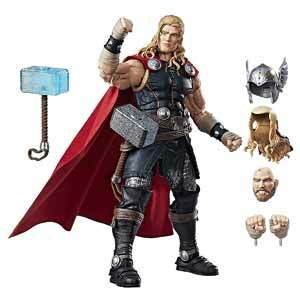 Here we have a very muscular God of Thunder, Son of Odin, with over 30 points of articulation. He is donned in his classic Asgard attire – complete with cape. There are two alternative hands and two Mjolnir hammers – one of which allows the light through it. The hands that are already on the figure are a left clenched fist and a slightly open right fist which grips the hammer. As you would expect the two spare hands are the opposite to this. So, you might have him hold both hammers, or may want to have him clench both fists and slot the handle of Mjolnir through his belt. In addition, there are two heads (always better than one!). 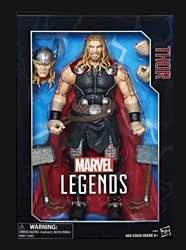 The boxed figure wears a full bearded Thor with long and unkempt hair – more of the natural warrior image. He even has his teeth clenched determinedly. The other included head has him clean-shaven, his long golden hair more in place, and his mouth closed. It is also adorned with the classic winged helmet. The good thing about this option is you are not simply restricted to swapping the heads as they are. You can remove the helmet and the hair to place the tidier hair and helmet on the bearded head, which looks rather good. I already possess an Artfx Kotobukiya film version Thor, which is very nice. I’m happy to report, however, that this 12-inch Marvel legends Thor is very different and certainly truer to the original comics. It is very impressive, with great attention to detail, even down to the boots. The figure is quite weighty, too – something I wasn’t expecting. Certain parties have cited the price as being a little steep at around the £80 mark. I would confirm that’s the case if you’re simply looking for a Thor figure for your four-year old plus child to throw around the room. However, there are a lot of serious collectors out there, and this is a well-crafted specimen to adorn the shelf. The Marvel Legends 12-inch series began with separate Iron Man and Captain America figures released on the back of the Captain America: Civil War movie. They continued with a Spider-Man and a logically larger 14½ inch Hulk. All of these have reduced in price a little since, so you will need to weigh-up playing the waiting game against the risk of stocks running out, after which prices will definitely hit the roof. Other characters emerging are Deadpool, Black Panther (to tie-in with the impending film) and Daredevil. I would certainly love to see the Spider-Man and Daredevil figures up close.